The hot weather continues and long may it, except of course it's getting a bit arid now and watering is beginning to be an issue. I try not to water the field crops if I can avoid it but everything is now so hot and dry that it's going into a sort of stasis, unable to make new growth and just hoping to stay alive until the rains come. This means trying to give everything a good drink at least once a week and fleshy plants like the courgettes and squashes need more regular attention than that. These are the first courgettes of the year grown in the garden, the White Cousa from Realseeds and the third (and fourth) cucumbers from the greenhouse. If I can keep cutting the courgettes at this size there should never be an insurmountable glut but I know how hard that resolution will be to keep. 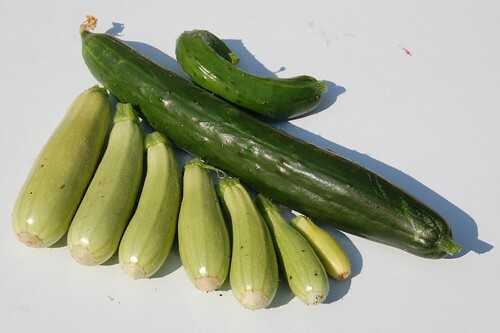 The curly tiny cuke comes from a plant that seems to have that tendency on all its fruit unlike its packet sister growing next to it which makes lovely straight fruit. You can understand why the Victorians had glass formers to force the fruit to behave but we're only growing to eat, not to exhibit so they can grow as curly as they like. There are always the courgettes that manage to hide under a leaf until they turn into young marrows, aren't there? I make the same resolution every year but have never kept it yet. In some years I have resorted to putting them in the compost but it seems so wasteful.